Pain is very common in medicine. This can be divided into acute and chronic pain. Acute pain is generated following surgery or when an acute traumatic injury happens. A soft tisue injury or a laceration of the skin irritates nerve endings that are buried in the tissue. The pain signals and neurotransmitters are different than in chronic pain. Acute pain is short lived, mostly only a few days and with remobilization and wound healing most of these conditions have resolved within 2 to 4 weeks (Ref. 1, p. 347). Chronic pain is one of the most common symptoms that physicians are consulted about in their offices. 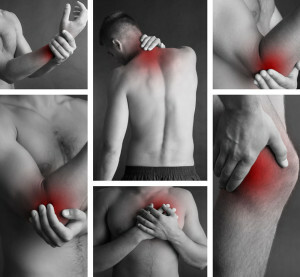 Chronic pain can have a multitude of causes. Typically it is caused from an underlying chronic condition such as rheumatoid arthritis, osteoarthritis or fibromyalgia. One subtype of chronic pain is thought to be due to irritation of nerve fibers or pain receptors (“nociceptive pain“). Another chronic pain type is thought to originate from damage or dysfunction of a peripheral nerve or from CNS pathology, such as a stroke or injury of the spinal cord (“neuropathic pain“). The first type is felt as a pressure or as aching, the second type as deep burning or excruciatingly stabbing. An example for nociceptive pain would be cancer pain, for neuropathic pain would be pain from a stroke, diabetic neuropathy in a chronic foot ulcer, or phantom pain after an amputation (Ref. 1, p. 753). When joints are involved in pain, there is usually associated joint swelling, stiffness and a lack of range of motion from the pain. Depending on what underlying structure is involved (joint, bursa etc.) there is a difference in the clinical presentation and finding. The patient needs to keep track of the pattern of pain and perhaps keep a diary of symptoms. It is a good idea to grade pain on a scale from 0 to 10 and communicate this to the physician when the history of the pain is discussed. What makes the pain better? What makes it worse? This will help the pain specialist to be able to deduct what type of pain he is trying to control. It is likely that the physician has already done some X-rays or other imaging studies such as MRI, CT scans or bone scans. Depending on the clinical impression there may or may not be a need to do more tests such as blood tests. A weakened grip can be measured using a Jamar dynanometer: 50 to 100 lbs. would be a normal range. In a patient with wrist pain due to a complex regional pain syndrome (=chronic regional pain syndrome) the best effort grip strength may only amount to 5 to 20 lbs. Links point to common pain conditions that are described in more detail. Under these links further diagnostic tests for these conditions can also be found. As the therapies in the various conditions vary according to the findings and to the underlying pathology, treatments will be reviewed with the pain conditions under these links. However, generally speaking modern treatment of pain consists of early reactivation after surgery. Splinting is avoided whenever possible. We have learnt a lot from the subspecialty of sports medicine with regard to early diagnosis, aggressive rehabilitation, and if necessary possibly early minor corrective surgery. If surgery is required, anatomical abnormalities should be addressed with minimum invasive procedures such as arthroscopic surgery to avoid extensive tissue damage and excessive pain. This gets the injured athlete through an injury a lot faster, with much less symptoms. Many other pain patients benefit from a similar approach, from stretching of injured tissues and early remobilization as soon after surgery as it is feasible. Often this is 2 or 3 days after the injury. Rest is avoided as much as possible. The links lead to other chapters where more therapeutic modalities are mentioned. “Downtoning” is a new trend that is catching on in recent years. For prevention of pain syndromes surgeons will often pre-medicate the patient just prior to surgery with one dose of 1200 mg of gabapentin (brand name: Neurontin), which was shown in a double blind study to reduce postoperative pain and pain pill use (Ref.2). This practice has been described in lumbar spine surgery (discectomies), abdominal hysterectomies and mastectomies. Gabapentin can also be used after surgery for a period of time to cut down on medication and help with early remobilization. Gabapentin also is useful in an adjunct to chronic pain management as is explained on the page that deals with treatment of diabetic neuropathy, which is a condition particularly difficult to treat. 4. Merck Manual: Overview of Pain (thanks to www.merckmanuals.com for this link).